These holsters from JM Custom Kydex are molded for the lightweight Glock 42. The one on the left features an anti-roll out extension. I have come rather late to appendix carry. However, after an honest evaluation I find appendix carry is an alternative to strong side or crossdraw carry but primarily as a choice over inside the waistband behind the hip holster. 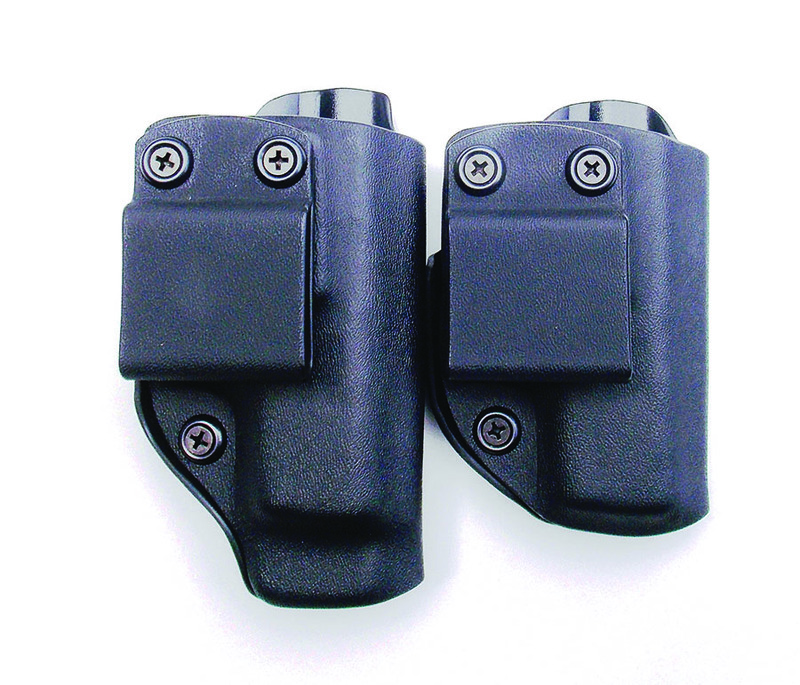 Purpose-designed appendix draw holsters have become available and many are well designed. This has made appendix carry more popular. Appendix carry isn’t for everyone and every body type. But for some it is the ideal carry. The bellyband holster is also a viable alternative. The cheap formless belly band must be avoided. But the good quality belly band holster from Galco is actually service grade, which is something of an accomplishment. The appendix and belly band types offer a strong side carry but unlike behind the back carry they offer a draw from where the hands usually hang. The draw is natural. As an observation the criminal element usually carries their handguns appendix style. This JM Custom Kydex holster is fitted with an anti-roll out feature. The handgun is stuffed in the belt to one side of the belt buckle. I have yet to see a criminal wearing a holster. Often small guns were carried in the pocket. Very few criminals are armed at all times. Most grab the pistol from under the car seat and stuff it into the belt before they commit a crime or assault. Typically the handgun is carried at a severe angle and it isn’t unusual for a felon to drop the pistol on the floor before he can draw the piece from the belt. By keeping the handgun in this position the piece may be drawn easily and if discarded there is no holster to bear evidence the felon was armed. Occasionally there is a bizarre humor in the criminal that manages to shoot himself using appendix draw but this is also a warning for the rest of us. 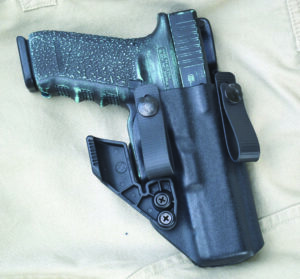 A standard IWB holster such as the Galco Stow and Go is well suited to appendix carry. These are versatile holsters. Then there are purpose-designed holsters such as those offered by JM Custom Kydex that are designed to offer good function as an appendix holster. I have examined a dozen or more holsters. This Galco IWB is light but well designed and works well for appendix carry. I find the less rigid types with good molding and a sweat guard to protect the body from the sharp edges of the handgun work the best. Appendix carry is a viable concept with certain advantages. There are also drawbacks. The strong side belt scabbard is the default holster that should be chosen when concealment allows. When a thinner covering garment or a short garment that will not cover the hand holster is worn, the inside the waistband holster should be chosen. Galco’s first quality belly band holster is ideal for concealed carry. A covering garment that covers a high riding belt holster is even more efficient with the IWB holster. 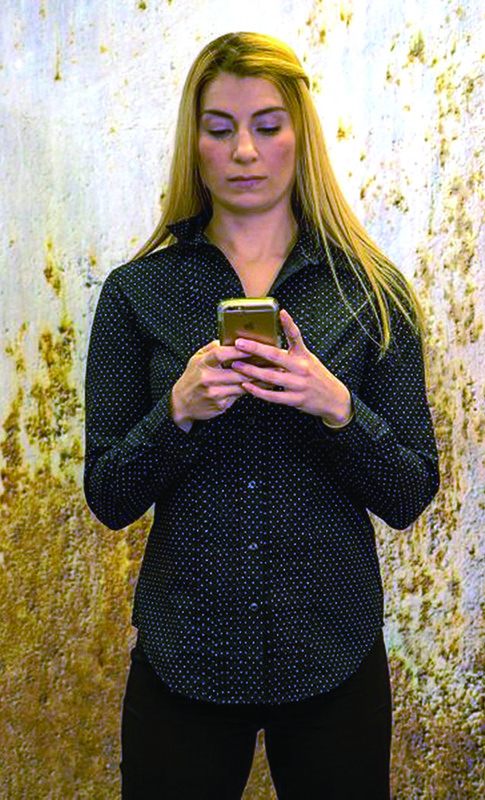 Even so, the handle of the handgun may print against the garment when the wearer bends steeply. Many holster and handgun combinations offer concealment in most circumstances but will not survive close scrutiny. 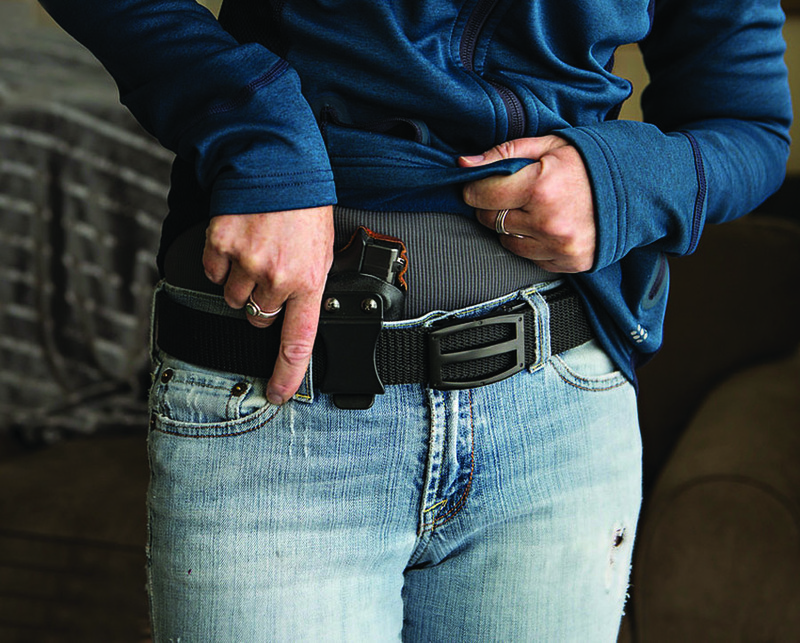 The IWB offers the advantage of concealing a larger handgun compared to a belt holster that requires a longer drape from a covering garment to conceal the holster. The IWB is worn inside of the pants and the garment need only conceal the handle of the handgun. In some ways the appendix holster is an IWB worn in the front but in other ways it is very different. The IWB requires the pistol be tilted into the draw to allow a rapid presentation from concealed carry. The tilt is a forward rake. The appendix holster requires a rear rake, handle behind the muzzle to afford a fast draw. The standard IWB cannot be simply moved to the front right of the belt buckle. Beginning the draw get the firing grip as you draw and be certain the trigger finger is outside the trigger guard. This is similar to moving a strong side holster to the crossdraw position. It simply doesn’t work out. A drawback to appendix carry is that it isn’t as well suited to longer handguns as the standard IWB. Larger handguns may pinch the body when we bend just as a long handgun will pinch the seat when we sit using an IWB holster. The Viper appendix holster offers excellent concealment. These handguns are not comfortable to carry in the appendix position. The appendix position may also limit bending, so be aware of the restrictions. The Glock 19 9mm carried by many in an appendix draw seems well suited to the carry, so does a SIG P229. It depends on the individual’s build and tolerance for weight. The higher the waist the better for appendix carry. Some wear a belly band type holster that isn’t dependent on a belt. For female shooters especially this carry mode offers advantages in a kind of modified appendix. Some wear the trousers higher for comfort and this may make for speed in drawing the handgun. The appendix holster is best suited to handguns with relatively short barrels and hand filling grips. This allows a good grip and a very fast draw. A concern with appendix holsters is roll out. This occurs when the holster rolls away from the body near the handle. 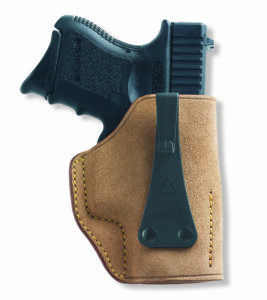 This depends on the design of the holster and the belt area spread of the user. The IWB holster nestles into a natural hollow in the back. The appendix holster may be forced away from the body by the mid-body spread. 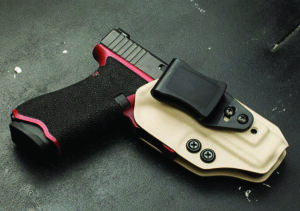 The JM Custom Kydex holster features a roll out feature. This device maintains the holster draw angle. A pressing concern is the direction of the muzzle in appendix carry. No one wants an accidental discharge of any type but this muzzle direction is particularly concerning. A bullet wound to any part of the body is potentially crippling or fatal. Note adjustments on Reign Tactical IWB. Only a service type holster worn on the point of the hip keeps the muzzle from covering the body. Most concealed carry holsters cover the body with the muzzle at some point. The muzzle rake most profitable in appendix carry results in the muzzle pointing toward tender and important parts of the anatomy. In some cases the muzzle points down the leg and follows the line of the femoral artery. When drawing a great deal of dry fire practice should go into the appendix carry. Trigger discipline must be observed. The finger is never in register until we fire, not when we think we will fire or may fire but when we fire. When deploying the appendix holster the drill I follow is to belt up the loaded gun and holster at the same time rather than belting on the holster and then the handgun. This simple regimen will serve well and works better than belting on the holster and then attempting to adjust the handgun. Appendix carry isn’t inherently less safe than any other and has advantages. But it is justified to take special care with the appendix holster.